1 set of Double pointed needles in the same size as circular needle. Sized to fit an average woman’s foot. Cast on 48 sts. Join in the round, placing a marker as you join, being careful not to twist your stitches. K1, P1 ribbing for 1 ½ inches. Continue knitting in stockinette sts until you have 6-8 inches from your cast on edge. Transfer 24 sts to a double pointed needle. You will now be working back and forth on the sts on the circular needle and also using an additional double pointed needle. Knit in this pattern for 24 rows. End with a purl row, turn your work. Knit across heel flap. Pick up and knit 14 sts from the side of the heel flap plus knit one stitch in the gusset corner. Place marker. Knit the instep stitches off your double pointed needle. Place marker. Next, pick up one stitch in the gusset corner and 14 sts from the remaining side of the heel flap. Knit the remaining stitches of your round. Round 2: Knit to 3 sts before marker, K2tog, K1, slip marker, knit to next marker, slip marker, K1, ssk, knit around. Repeat these 2 rounds until you are back to 48 sts. 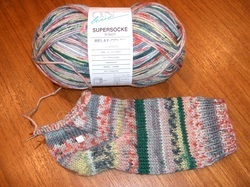 Continue knitting in stockinette st until you are approximately 1 ½ or 2 inches from the top of your longest toe. Transfer half of your sts onto a double pointed needle. Needle 1: K1, ssk, knit until the last 3 sts k2tog, K1. Needle 2: K1, ssk, knit until the last 3 stitches, k2tog, K1. Continue in this manner until 16 sts remain. Using kitchener stitch, graft remaining stitches together. ssk - (slip, slip, knit) Slip 2 sts one at a time as if to knit. Insert left needle through front of sts from left to right and knit these 2 sts together.